To us, Chiapas is authentic Mexico. Tulum and Yucatan are often what we, tourists, imagine Mexico to be. They truly are gorgeous parts of Mexico but Chiapas is a little gem way less touristy and offers more than beauty. This little paradise region, at the border with Guatemala, is a unique destination offering a plethora of historical treasures and is the stronghold of indigenous culture with some tribes such as the Tzotziles, still very present in some remote areas of the state. Spectacular waterfalls , impressive lost Myan pyramids, gorgeous colonial villas: you’ve just boarded on a fantastic journey in Chiapas, on the Maya steps. Nature lover or History afficionado, Chiapas will leave you speechless. Travelling there is a bit similar to travelling back to the time of the explorers. We have listed below top activities we recommend to do, when in the area, if you want to truly experience this fantastic region. Yaxchilan: Yaxchilan ruins are probably one of our favourite ruins (even though we love all Mayan things) because the breathtaking site is located on the Usumacinta River which means you can actually get there by boat from Frontera Corozal. During its hey-day (the Late Classical period of 800 to 1000 AD), Yaxchilan developed into a very powerful and influential urban and trade center on the banks of the Usumacinta River. The site is made up of over 120 structures grouped in three main sections: The Grand Acropolis, the Small Acropolis and the Great Plaza. Plan half a day there at least as there is a lot to see and you really want to take some time to wander on your own and feel the space. These amazing ruins, are not overly crowded and feature howler monkeys for the atmosphere! A real off the beaten path jungle adventure 😉 The best preserved building in Yaxchilan is Edificio 33, which you have to climb up to see properly and enjoy; there is an ancient stairway to it that rises up from Stele 1 (see picture above). Great to take these views in! Palenque (Spanish name for fortification) is a very touristy place, especially since the opening of the nearby airport and therefore we would usually not recommend it but the ruins of Palenque are one of the crown jewels of Mexico so as a culture fan, it’d be a shame not to visit this impressive site. Picture this: it’s a misty day and it’s drizzling. Deep in the jungle of Eastern Mexico, you’ve been walking for a few minutes. All you can hear are the echoing sounds of parrots and howler monkeys, the sound of drizzling rain on the mosses around you and the sound of your feet on the wet jungle floors. Suddenly, the mist disperse into air and you’re standing in front of magnificent, impressive Mayan structures. You’ve stepped into a lost world in the jungle! This is how we would describe our experience of Palenque. Secluded deep inside the jungle, at the border with Guatemala, lies Bonampak. Small in size, Bonampak is however of significant importance when it comes to the role it played in helping us get a better understanding of the Mayan civilisation history. Archaeologists date the city back to 790CE. Touted has having the finest examples of classic Mayan frescoes, the highlights of the site is undoubtedly the very unique, highly detailed and remarkably well-preserved Maya artistry–paintings. The fabulous murals are well worth a trip and gave its name to the site, as Bonampak means painted walls in Mayan. Definitely a must see if you’re in Chiapas! Those interested in Mayan history or the history of Mexico will find this place fascinating. This pyramid and city are still in need of much more archeological excavating work but researchers believe that Izapa was first settled in about 1500 BC and was inhabited until around 1200 AD. The ruins are located just outside the town of Tapachula in southern Mexico near the border of Guatemala and at the foot of the Tacano volcano. Although not as large as some other sites, it does have several pyramids, numerous carvings and a ball court which indicate a culturally developed society. The ruins and the volcano are definitely 2 big attractions in the area so if you’re looking for a place to stay for a few nights whilst you explore the surroundings, we’d recommend the Argovia Finca Eco Resort. Originally set up as a coffee plantation, the resort has diversify since then and now also grows exotic flowers making for magical back garden views. The cuisine provided is very fine mixing European and Indigenous influences and everything on the property is organic. The fruit trees provide visitors with enchanting smells. The surrounding views include breathtaking sights of the coast and the mountains making the stay a very relaxing one among flowers and chirping birds! On this journey through Colonial Mexico, you’ll be blown away by the prettiest cobblestone streets, delightful balconies and lush courtyards, colorful traditional dresses worn by indigenous communities, the enchanting smell of Mexican food and the breathtaking views of Pre-Columbian Sites. You’ll be charmed by rich crafts traditions and welcomed by the smile of friendly locals. Let’s dive in, shall we? This colonial jewel is home to the largest indigenous population of Mexico and is therefore the indigenous cultural capital of Chiapas. There, the Tzoltzil and the Tzatzal live side by side. Not only does San Cristobal De Las Casas provide its visitors with enchanting city views with its bright and colorful blues and deep red tones, but it is also surrounded by a jaw-dropping panorama of pine trees and green subtropical hills. The city center has kept its Spanish colonial layout and is flanked with red clay tile roofs, narrow cobblestone streets and wrought iron balconies often decorated with flowers. Talking about colors, the indigenous people of Chiapas still wear colorful traditional dresses and are praised for their exceptional weaving skills. If you’re keen to take a few souvenirs back home for your close ones, you’ll find a plethora of colorful scarves or blankets on offer in the streets! Among the must do in San Cristobal, we would recommend wandering the streets, the food and textile markets at the Zocalo and Gran Mercado and get to immerse yourself in the local culture. The main plaza shelters a beautiful church, the San Cristóbal de las Casas Cathedral worth visiting. If you’re into churches and you like a bit of exercise, another great church to take a look at is Iglesia de Guadalupe as it is perched on top of a hill. The reward for the steep walk will not only be the gorgeous church itself but also the spectacular views of the city and its surroundings you’ll get from up there. On the list of the 101 pueblos magicos (magical villages) Comitan, is a good base to explore some of Chiapas’ most breathtaking natural attractions like El Cascada del Chiflon or Montebello Lagoon. The colonial town is made up of nine neighborhoods in reference to its former name Balun Canun which means place of the nine stars. San Caralampio is one of these nine neighborhoods and just like in San Cristobal de Las Casas, you’ll be welcomed by bright painted wood doors, courtyard gardens and colonial balconies. The main plaza, El Zocalo, is the heart of the town and shelters the church Iglesia de Santo Domingo featuring the Mudejar art. There are a lot of small streets around the Plaza which sell local handcrafted items. If you’re lucky enough to be there at the right time, head over to San Caralampio to witness children parading the flower adorned streets wearing devil masks towards the Templo during the Feria de San Caralampio. Last but not least, the Museum of Dr. Belisario Dominguez – The former home of the Doctor after which the town was named – can be found in the southeast of the main plaza. This is a gorgeous typical 19th century house with delightful balconies and colorful gardens which complement the historic architecture of the building. 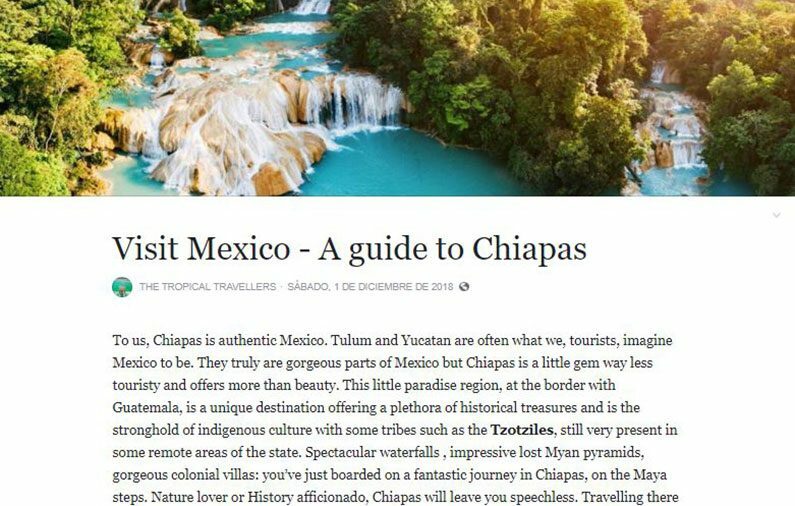 Some of the natural beauties we’re listing here are unfortunately very touristy and if you’ve been reading us for a while you know we prefer secluded and intimate little gems, but your experience of Chiapas wouldn’t be complete without checking out these natural wonders. Agua Azul and Cascada el Chifflon are one of these majestic wonders! Blue water in Spanish, the Agua Azul cascades consist of many cataracts following one after another, taken from near the top of the sequence of cascades. The water is – you would have guessed – pristine blue and the usual reinvigorating cold 😉 The blue hues are due to a high concentration of minerals in the water that gets deposited on the rocks. Once there, stick to the pools that are safe to swim in as there are rip currents underneath some of the pools. The best time to visit is between November and May. Cascada el Chiflon are to be deserved. Their spectacular turquoise blue and green hues will, once again, leave you speechless but be wary, getting to the top is not an easy climb. Indeed, the steep 1000 meters you need to climb are all going up. However, trust us, when you reach the top, it is worth every step. Standing on top of this magnificent and powerful waterfalls will take your breath away and will make you want to dive straight in. It’s also a great place to camp and spend the day soaking in the beautiful river views. Looking for a more intimate experience? Las 3 Tzimoleras should do the trick 😉 After a breathtaking drive through the mountains from Comitan, you’ll arrive at Las 3 Tzimoleras. Not only are these 3 waterfalls beautiful, but they are also untouched and provide visitors with a very intimate experience as opposed to other very touristy falls in the region. Once there, you are offered with two choices: you can relax on the hammocks or venture in the rather cold water. The volcano Tacaná is the second highest peak in Central America at 4,060 metres. Fumaroles and hot springs attest to its activity. Chiquihuite is the starting point for hikes on the slopes of the volcano (guide recommended). The first lookout point is a 2hr30 walk. Ascent to the crater (Nov-Apr) takes approximately 6 hours and a good physical condition is required. Once up there, the views will leave you speechless and make the steep walk well worth it. Probably one of the most magical places in Chiapas, Sima de Las Cotorras is a sinkhole located in the western part of the state. Best known for the thousands of Mexican green parakeets who live there most of the year, the site will offer truly enchanting experiences to its visitors. Picture this; it’s sunrise, you’ve embarked on a long journey to get here and are about to see a fascinating phenomenon as the crepuscular rays start radiating the scene. Thousands of gorgeous birds including green parakeets are about to emerge from the depth of the lush hole and put on a remarkable show, spreading there wings, flying in and out in circular patterns for a few hours. If you love a bit of an adventure, there are plenty of rappel and hiking options as well as caves to cater to bird watching aficionados. The canyon’s creation began around the same time as the Grand Canyon in the U.S, by a crack in the area’s crust. Sumidero Canyon has vertical walls which reach as high as 1,000 metres. Home to incredible diverse wildlife , during your trip there, you’ll be embarking on another magical journey! Whilst taking in scenic views, you’ll also be able to spot birds, crocodiles, spider monkeys and even pelicans! The best thing to do is to hop onto one of the river cruise boats at Chiapa de Corzo and enjoy the majestic canyon views whilst sailing on the river. Secluded, right at the border with the decadant Lacandon jungle lies Chiapas’ jewel; The Lagunas de Montebello! The Lagunas de Montebello is a national park near the border with Guatemala, comprising 59 multi-colored lakes in a pine forest. When we visited the Lagunas De Montebello a couple of years ago, we were virtually alone. The long and uncomfortable ride from San Cristobal in an autobus collectivo at 4am was well worth it! Surrounded by forest pine trees, green and blue waters and a few friendly locals cooking tamales on the side of the rugged muddy road, we were in awe! The specificity of the site is that each of the majestic lake has a different color. We hope this inspired you for your next trip to Mexico! Please share if you’ve visited other beautiful places in Chiapa as we’re always eager to share experiences with our readers.